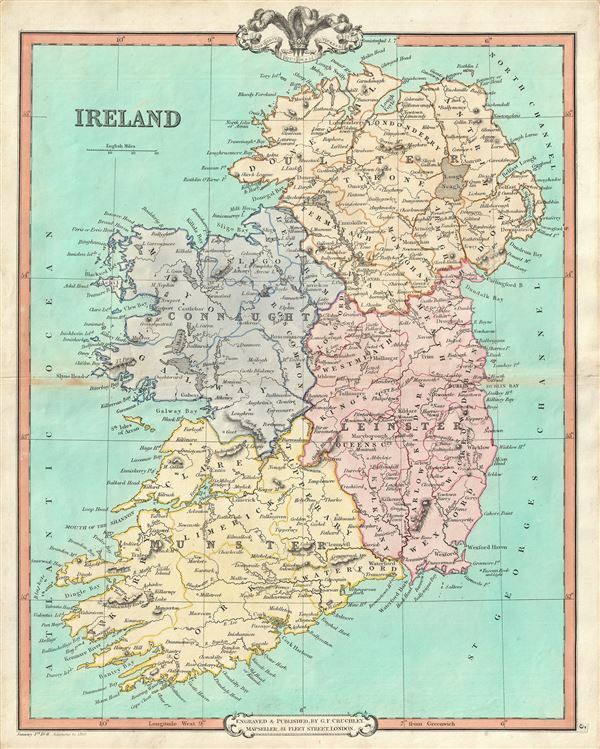 A lovely 1850 map of Ireland by George Frederick Cruchley. The map covers the the entirity of Irealand and is divided four provinces: Ulster, Connaught, Leinster and Munster. Tuscan Rock, near the southeast coast of Ireland, known to have destroyed more ships than any other Irish coastal feature, is identified. Cruchley's map is color coded according to provinces and identifies important towns, cities, rivers, mountains and an assortment of other topographical features. Relief is rendered by hachure. After the Norman Invasion, the old provincial structure was supplemented with modern system of counties – even so, the old provinces are still referenced today. In 1801, the island of Ireland became part of the United Kingdom of Great Britain and Ireland. Though Britain flourished during the 19th century, Ireland suffered a series of famines, the worst being the Great Irish Famine, which lasted from 1845 – 1849 and killed about a million people. As a result Ireland experienced a widespread exodus – mostly to the United States. By the end of the 19th century, almost 50% of immigrants into the United States were from Ireland.